In the study the features and dynamics of investment support of Ukrainian agricultural enterprises are investigated. It concerns estimated investment in fixed assets of Ukrainian agrarian enterprises by sources of financing. 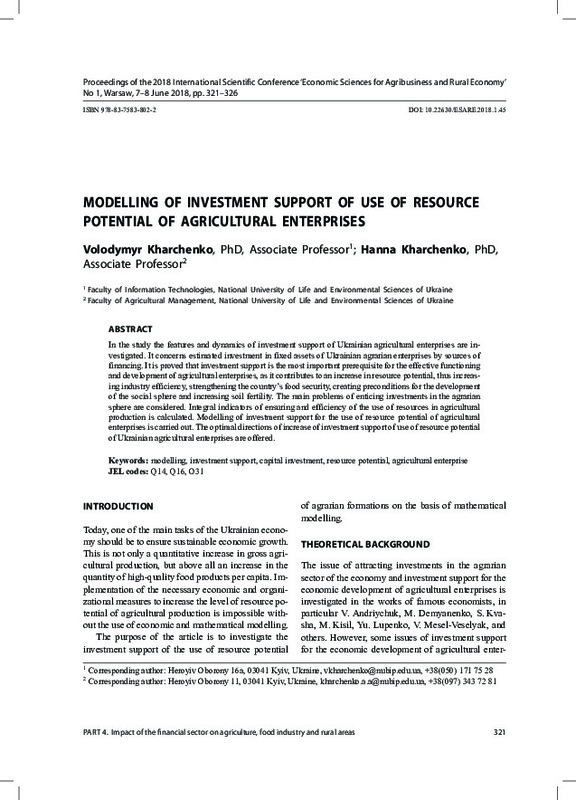 It is proved that investment support is the most important prerequisite for the effective functioning and development of agricultural enterprises, as it contributes to an increase in resource potential, thus increasing industry efficiency, strengthening the country’s food security, creating preconditions for the development of the social sphere and increasing soil fertility. The main problems of enticing investments in the agrarian sphere are considered. Integral indicators of ensuring and efficiency of the use of resources in agricultural production is calculated. Modelling of investment support for the use of resource potential of agricultural enterprises is carried out. The optimal directions of increase of investment support of use of resource potential of Ukrainian agricultural enterprises are offered.